This is a reproduction of a book published before 1923. This book may have occasional imperfectionssuch as missing or blurred pages, poor pictures, errant marks, etc. that were either part of the original artifact, or were introduced by the scanning process. We believe this work is culturally important, and despite the imperfections, have elected to bring it back into print as part of our continuing commitment to the preservation of printed worksworldwide. We appreciate your understanding of the imperfections in the preservation process, and hope you enjoy this valuable book.++++The below data was compiled from various identification fields in the bibliographic record of this title. 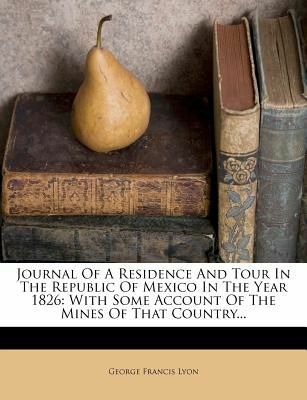 This data is provided as an additional tool in helping to ensure edition identification: ++++ Journal Of A Residence And Tour In The Republic Of Mexico In The Year 1826: With Some Account Of The Mines Of That Country; Journal Of A Residence And Tour In The Republic Of Mexico In The Year 1826: With Some Account Of The Mines Of That Country; George Francis Lyon; Selected Americana From Sabin's Dictionary Of Books Relating To America; Fiches 21,329-21,336; Issue 25456 Of Goldsmiths'-Kress Library Of Economic Literature; Volume 1 Of Journal Of A Residence And Tour In The Republic Of Mexico In The Year 1826; George Francis Lyon George Francis Lyon J. Murray, 1828 Technology & Engineering; Mining; Mexico; Mines and mineral resources; Mines and mining; Mining engineering; Technology & Engineering / Mining; Travel / Mexico.